This overview of the Bible provides readers with an aerial view of the landscape of Scripture, scouting the major truths of the promises of God. Originally delivered as sermons by pastor Mark Dever at Capitol Hill Baptist Church in Washington DC, these three studies are now available in one volume. Dever guides readers to take a step back and look at the Bible from a broader perspective. As we notice new features of an object when viewed from a distance, so too the major themes of Scripture become more apparent when we take in the Bible as a whole. Part of the IXMarks series, this book considers the central messages of the Bible as seen in the promises of God. 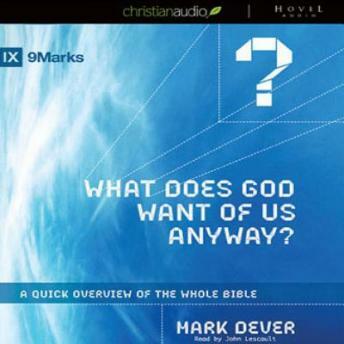 Dever examines the general narrative of God's Word to answer the question, 'What does God wants of us anyway?' Readers looking for a panoramic view of Scripture will be reminded of the faithful, persistent love of God and find themselves drawn into a broader, but deeper, understanding of the maker and keeper of promises.